Wonderbird—Mississippi’s first grain-to-glass gin distillery which we first reported on last June—has spread her wings and is almost prepared for flight. The distillery, five miles from Oxford down Old Taylor Road, is in its final phases of construction and decoration. They will soon be open to the public, partners Rob Forster, Chand Harlow and Thomas Alexander said. Hottytoddy.com’s Anna Grace Usery caught up with the trio over a gin martini to talk about what the community can expect from the experience of the distillery. 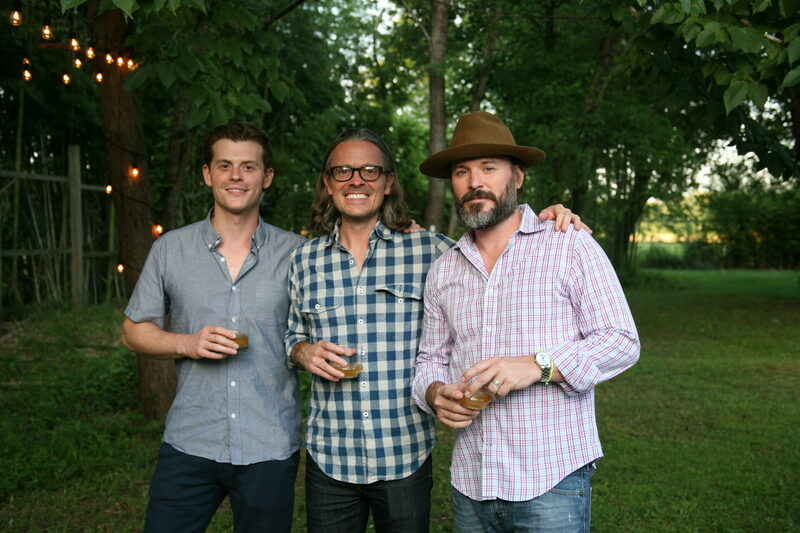 Co-owners Chand Harlow, Rob Forster and Thomas Alexander are establishing Mississippi’s first grain-to-glass distillery, Wonderbird Spirits. Photo courtesy of Rob Forster. Anna Grace: Guys, the last time I was here the building was still in the beginning stages of coming together. Tell me about your progress since our first meeting. What are some of your successes and failures? Tom: We’re in an exciting phase right now. We’ve come to the end of the initial construction phase and are into the recipe development phase, which is why we all got into this. We’re pretty confident we’ll have two more months of this kind of development process before we’re out in the market. We’ve had some short-term successes using the space for events—we had St. Leo out here to host their staff holiday party—and have a couple of events booked for the springtime. Chand: We’re now at a place as far as construction and decorations go that we’re open for business for private events. That’s a new change. Now we’re trying to get people out here just to show them what we’re doing and get them interested in our story and our business. We got our landscaping done, but have more work to do once the weather is nicer. Rob: I think as we start to look ahead to springtime we have gotten the property in shape such that people will really enjoy not only the distillery experience but the location and grounds as well. Anna Grace: Can you describe the space to someone who hasn’t visited yet? What are some things about the space you’re excited about? The factory windows by the front entrance to the Wonderbird Distillery allow the bar area to be filled with natural light. Photo by Erin Austen Abbott. Chand: The bar has a steel countertop and is wrapped in brass. We were really excited to get our stools mounted and provide a nice place to relax in. We’ve got some paintings from Carl Blackledge on the walls. We’re still developing the décor. The production space is pretty much totally done. We’re just trying to keep it as streamlined and clean as possible, which gets difficult as you get more and more equipment. In the tasting room we’ve tried to mix old school and new. We’ve kept contemporary lines with the balance of antique furniture. All of our colors are fairly dark and muted, but it also feels open in here with the big factory windows in the front. We got them from an old warehouse in Chicago. We’ve tried to bring in as much natural light as possible throughout the building. Tom: It’s worth noting we designed a lot of this stuff by ourselves and had a lot of local help in manufacturing it—like the bar top, the frame for the bar, the stools, the footrests—everything was done by local builders and welders we’ve been fortunate to have built relationships with. They’ve been really great to work with. Anna Grace: How do you want patrons to feel when they’re here? Rob: We are aiming for a relaxed atmosphere, a sense that you’ve left Oxford but haven’t gone so far. I think the five-mile drive on a pretty road helps with that. As Chand said, so does a lot of natural light and clean lines. We want people to come here, relax, have a good time. Chand: We want it to be a place you can really enjoy getting into gin and enjoy tasting it. A place where you can feel Mississippi in a new context. We’re using Delta rice and our botanicals focus on the things around us as we develop flavor profiles of the first gin and subsequent seasonal gins. This juniper berry gin distillate is one of several the Wonderbird owners are experimenting with the make their signature gin. Photo provided. Anna Grace: You mentioned the Delta rice. An integral part of your distilling process really changed when you thought you wanted to use corn or sweet potatoes as the agricultural element but switched to rice. Can you tell us why that’s beneficial for your gin? Tom: I think, ultimately, we found that we really like the distillate—the neutral grain—that we could make from rice. We experimented with corn and some other agricultural bases and one of the things that’s difficult for distillers generally when looking at rice is that it takes extra steps to process and that it’s often cost prohibitive to source because of how far you have to get rice in most of the world. But we’re in this lucky situation where we’re close to some really wonderful rice growers who make world-class rice in our backyard. It just happens that the rice made a distillate that fit our palettes perfectly for making a gin and provided this canvas to really allow us to accentuate the flavors we wanted to put forward in that taste profile. It all worked out as a great synergy because we all wanted to have something that spoke of Mississippi and is grown right there in the wetlands that they’ve flooded in the Mississippi River Delta one hour from here. It also falls right in line with Japanese influence we all like. Rob and I visited there when we were younger. I know Chand has always had an affinity for Japanese food and culture, so to have rice as a base fit in with all that. It allowed us also to explore some really cool things like making koji, which is specific to making alcohol with rice. That’s something we’ve really gotten into. Anna Grace: Is using koji (a traditional Japanese fungus used in fermentation) unique to this area? Rob: To my knowledge, I think we’ll be the only North American gin made out of rice. We can’t speak to the rest of the world, but we do believe we’re a global first as far as Mississippi Delta rice being used as a fermentation substrate for gin. Our supplier Two Brooks (located in Sumner, Mississippi) is a great farm and they’re great people. We like to keep everything we do as local as possible for a variety of reasons, so this just made sense to us. Are we going to try to make gins out of sweet potatoes and corn at some point down the line? I sure hope so. We see this as an enterprise that’s always developing. There’s a concept in Japanese culture, kaizen, where you’re constantly trying to make little minor improvements in everything you do. Chand: The result spoke for itself as far as the alcohol that the rice produced. In conjunction with that, we also really like the process. Anna Grace: I know you’re still developing flavor profiles, but tell the readers where you are on the process of distilling. Tom: We are producing our own neutral spirit and are using it to develop our botanical profiles. We have distilled 26 different, single botanical distillates. That’s our base library for blending to create the recipe of botanicals that will make our signature gin. Concurrently, we are refining our fermentation process, which is where we take the raw agricultural products and create the alcohol using yeast and koji. Chand: We’re in the blending phase which is exciting because it took us a while to get here. We hope to have something out in the spring. Rob: The truth is, people ask us how long it’s going to take to have the product and we don’t know the answer because we don’t know how long it will take to make it really, really great. Chand: We’re not going to accept a subpar product just to hit a timeline. We’re going to make sure it’s what we want it to be. Anna Grace: What’s something you’ve learned about yourselves during this process? Rob: It’s been a great lesson in committing to a project and a partnership and knowing that you made that decision after a lot of deliberation and then believing in it. Committing all the way and knowing your partners can help fill in blanks you might have and that the totality is eventually going to get to the right place. There are times along the way when you might do it differently if you were operating by yourself, but knowing the strength of the team and commitment of each of us to all the aspects of building a business and believing is powerful. For me, it’s just staying really positive and taking challenges as they come. Tom: We’ve learned a lot of practical things, like how to build things we didn’t know how to build before. How to distill and ferment things differently than we’ve ever conceived of before. I think more to the heart of your question, it’s taught me patience. It’s also, to an extent, validated an idea that doing something that I really love to do has made my quality of life richer. I don’t like to bring up the money part of it, but after all, it is a business and we haven’t made any during this process. It still feels really wonderful coming in here to do what I like to do because I believe in the project. I believe the rewards will come down the road if we do everything the right way. To Rob’s point, we have to keep believing in the final vision of this thing and keep putting one foot in front of the other to get there. Chand: I pretty much mirror everything they just said. This taught me about starting a business in general. It’s an unbelievable number of things that no one unless you’ve done it, appreciates or understands what all went into it. There are so many different variables and hurdles you have to go through. The community has been great to us. We’ve definitely had a few hurdles to get over, but at the same time, we’ve all learned a whole lot. Once you go down that path one time then you start realizing what’s really involved to make this all happen. Now I look at little mom and pop businesses and have a better appreciation for what it took to get there. Anna Grace: What’s the goal here? What do you want Wonderbird to accomplish? Rob: Isn’t it a world-class gin made right here in Mississippi that we can be super proud of, that the community can be proud of? I think so. Tom: We also want a place the community can come and enjoy themselves. That’s part of it. Rob: We want this to be part of the firmament of this terrific community and, further, to make a truly impressive series of products that will, in success, showcase this area to people all over the world. We want people coming through here to know this is a place they can come and have a great two hours. Tom: Furthermore, we want people who might not otherwise have been planning to come here to come because of Wonderbird and the mystique of this area. Chand: A dream is that one day some international gin aficionado decides he or she wants to come to Mississippi to see Wonderbird’s distillery. When that happens it’ll be a great day.